Stephen Perfetto scores in overtime to cap Tulsa’s comeback win in Game 2 to tie a best-of-seven series heading up to Kansas City. TULSA, OK– Down by two goals in the third period and in danger of falling into a 2-0 hole in their Mountain Division Semifinal series, the Tulsa Oilers (1-1-0) battled back to defeat the Kansas City Mavericks (1-0-1), 3-2 in overtime Sunday at the BOK Center to even the series 1-1. While the Oilers outshot the Mavericks 13-7 in the opening period, Kansas City struck first when Mark Cooper picked off a clearing attempt in the high slot and his shot was tipped into the net by Corey Durocher. That was the only goal for either side in the period, as Mason McDonald stopped all 13 Tulsa shots, and Devin Williamsstopped six of seven Mavericks attempts. Joey Sides added to the Mavericks lead when he snapped a shot past Williams from between the circles to make it 2-0 at 13:03 of the second period. McDonald turned away all 15 shots he faced in the frame and carried a 28-save shutout into the third. Tulsa captain Adam Pleskachbanged a loose puck into the net on a scramble in the third period to put the Oilers on the board 6:49 into the stanza. Jared Thomas then tied the game on a one-timer from the right wing wall with 8:05 left in regulation, forcing overtime. Almost nine minutes into the extra period, Alex Dostieskipped a pass from the left circle into the slot for Perfetto cutting to the net. Perfetto fanned on his initial attempt, but recovered and snapped the game-winning goal under the crossbar, sending the Oilers’ fans home happy. The best-of-seven series shifts to Independence for Games 3, 4 and 5 at Silverstein Eye Centers Arena, starting Wednesday at 7:05pm. Catch all the action on the Sports Animal Radio Network, www.tulsaoilers.comor ECHL.TV (away feed), with pregame coverage starting at 6:45pm. 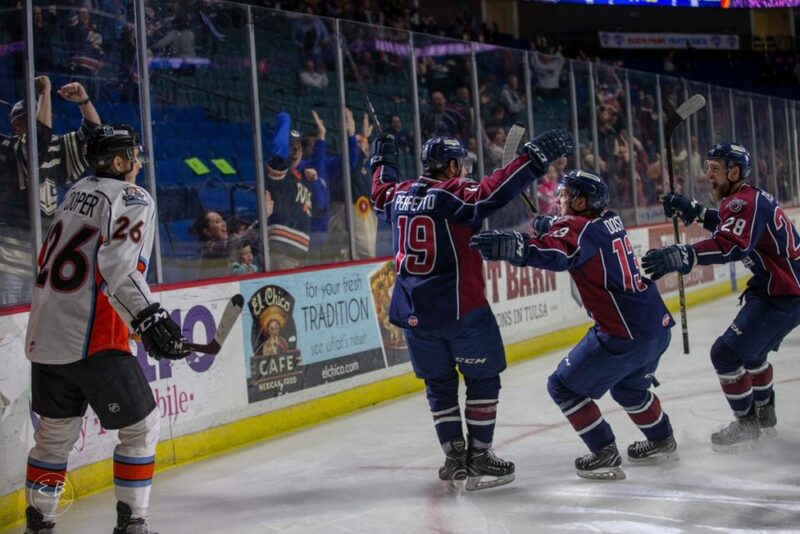 Call 918-632-7825 or visit www.tulsaoilers.comfor more information on playoff tickets to Games 6 and 7 (if necessary) scheduled for Tuesday, April 23 and Wednesday April 24 at 7:05pm at the BOK Center.